Used buses and trains it's easy and cheap ! The SNCF line serves all the villages from Saint Gervais-le Fayet to Martigny (Switzerland), passing through Servoz, Les Houches, Chamonix, Argentière and Vallorcine. One train approximately every hour. 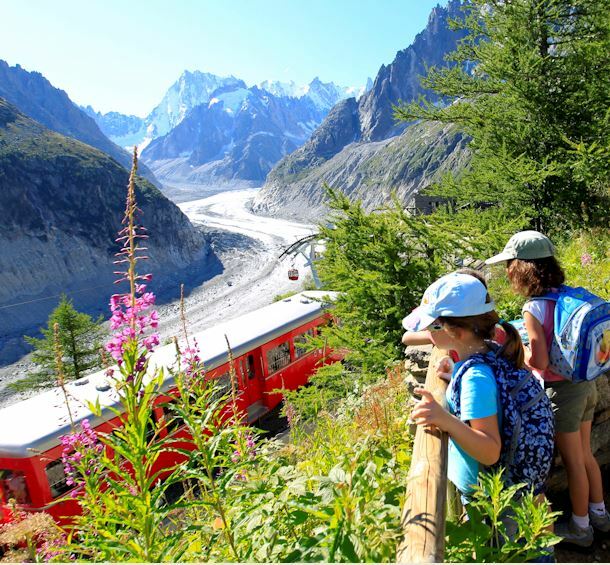 The SNCF line from Servoz to Vallorcine is free of charge for holders of the Carte d’Hôte pass, which is given to you on your arrival by your accommodation host. Carefull : During winter season in case of bad weather, schedules may be different. The Chamonix bus network runs annually and offers extra services during winter and summer season. Regular urban transport serves all the Valley and ski areas. It is free from Servoz to Le Tour for holders of the Carte d’Hôte pass or a ski-lift pass. This free shuttle service enable you to to move freely around the Chamonix centre. Small buses, silent, disabled access and environmentally friendly, "Le Mulet" works all year long and stops by the main sites and parking lots. Baptized "Le Mulet" in reference to the history of the valley, the city center free shuttle was born in Chamonix in 2005 in partnership with the city council of Chamonix-Mont-Blanc. The on demand service is fully accessible. The bus service operates everyday from 8:30 am to midday and from 2:00 pm to 5:00 pm. - person with moving difficulties : submitted to the local authorities. Access to the service is allowed with a 10€ subscription per year and a proof of disability. A card is delievered at Chamonix Sud stops. Passengers can and need to pre-book the journeys by contacting 00 33 4 50 53 05 55 the day before, before 5 pm (Friday for the weekend and Monday). You can also book 4 hours before, subject to the vehicule availability. Tourist accommodation: the pass is given to you free of charge by your accommodation host on your arrival. Do not hesitate to ask for it. If you are staying in free accommodation, the pass must be withdrawn exclusively from the town hall or the Tourist Office, for 10 euros per person for every week of stay. Timetable and rates from April 6 to June 28, 2019. Timetables and rates from April 15 to June 28, 2019. Timetables from April 5 to June 28, 2019.